Welcome to a vacation home that has it all; in the resort that has it all! 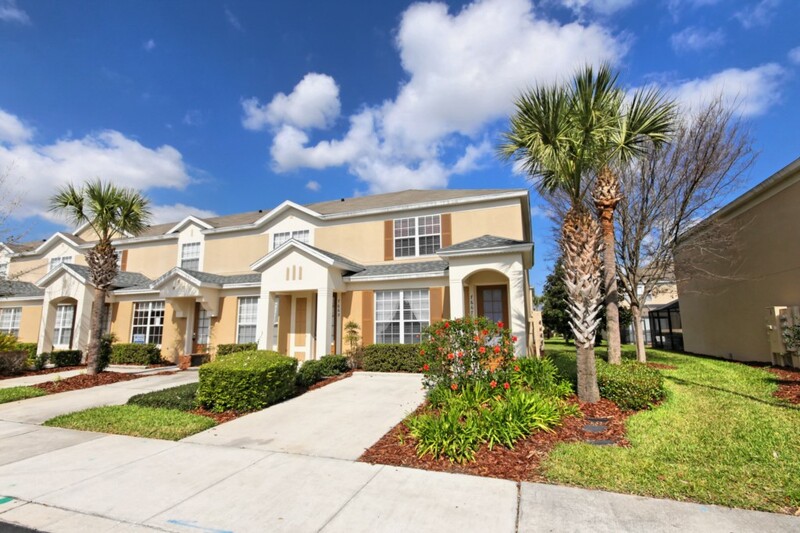 Windsor Hills is the closest 5 star gated community to Disneyworld Resort, just 2.5 miles and is widely regarded as the best vacation resort in Central Florida. This superbly equipped and upgraded town home with private pool makes the perfect base for your next fun-filled vacation. For the larger group we offer another, almost identical home next door. This superbly furnished vacation home been extensively upgraded and generously equipped. The property is located in a quiet street about 200yds from all the community facilities and has its own private splash pool with heating option in the cooler months. Our prices include all resort fees, use of the main pool, gym etc. For those wishing to stay in touch with the outside world the home offers WiFi and free national calling. Our granddaughters will be coming out for their summer vacation from Oregon, we wanted their vacation to be very special. We were Orlando bound and I checked to rent a condo, I found a townhouse with VRBO. Checked in and we love the place, it was so comfortable, the rooms were nicely appointed and the girls loved their Mickey Mouse room. Made life easier, there was a washer and dryer with the townhouse. The whole place was tastefully furnished, furnishings were top of the line. Lots of linen and we were very comfortable with a quick dip in the pool after a long hot day at the parks. We will definitely be back when the next group come visiting. My husband and I surprised our 5 and 7 year old with a trip to Disney and just returned home today. When I was planning our trip I looked at several options on the disney property and could not justify such an expense for a single room or 2 rooms and 1 bathroom for 5 people (my brother stayed with us). I decided to look off property and compared many homes with this one. I selected this one because it seemed to have everything we needed as well as being super convenient to the Disney parks. When we arrived, check in was easier than any place we had ever stayed. We just showed the security at the gate our ID and paperwork and we were good to go. When we got to the place we realized it was just as pictured! We settled in fast, bought our groceries and began planning our park visits. We were able to comfortably make breakfasts each morning, pack our lunches and drinks for the parks and come home to cook dinner some nights. Our bed was comfortable and our children loved the disney themed room with bathroom. My brother was very happy in the guest bedroom with his very own bathroom. (By weeks end I imagined how unhappy we would have been sharing 1 bathroom or sleeping in small quarters for an entire week) The laundry was another plus. We packed light and did laundry a couple of times. This was the perfect place for us and when we come back to Orlando we will look to book this place once again! We stayed here for a week, and all I can say is this - my eldest daughter was teary eyed when we had to leave. The place was wonderful, had everything you needed and was in a very nice location. Being in a gated area with great security we felt safe and that allowed for us to walk around the expansive area in the evenings. The 3 rooms were comfortable, beds to die for! We enjoyed the ability to cook and even had the courage to enter the pools on one of the more sunny days. Place was so comfy that my mum even decided to stay at the property instead of Disney! Paul was really helpful and answered all my queries promptly. Another great thing about this property is its location and distance to the Disney parks - everything within 10 minutes and another 10-15 minutes to the Premium Outlets as well as SeaWorld. Will definitely look towards staying here the next time we visit. We absolutely were blown away with the home! It is amazing and was really hard to leave! 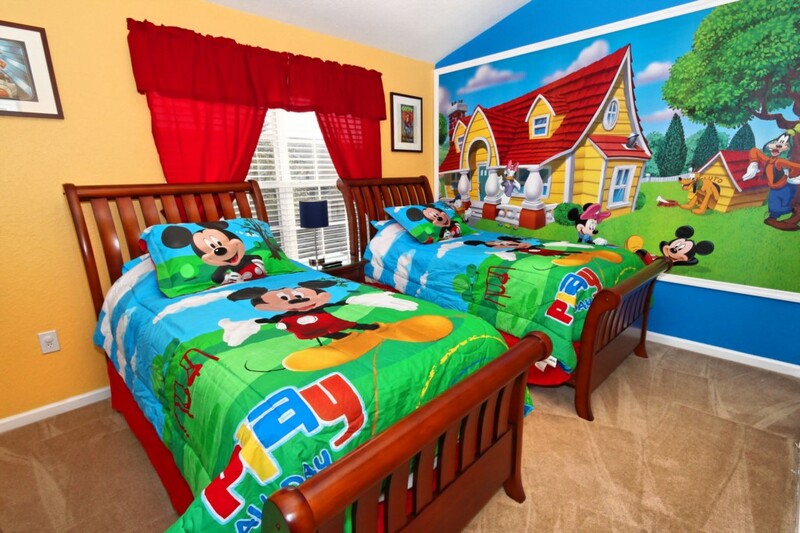 My 4 year old son loved his Mickey Mouse room as did I. My 16 year old daughter loved her room & bed. I was very comfortable in my bed. Thank you for opening up your home! We will definitely use again! My favorite part of the house is the Disney room upstairs. The comforters and the huge mural are so cute. I slept in the downstairs and it was great. My parents stayed in the master bedroom. They like their room and I liked their bathroom. My brothers slept in the Mickey room. I thought that the TV’s in every room was cool. Another of my favorites was the pool outside. It was nice to swim in at night. Thank you for providing us with a wonderful home away from home. It was such a wonderful experience. Can’t wait to come back! We had a wonderful vacation at your Disney townhouse! Both kids loved the Mickey room upstairs and my husband and I found the beds extremely comfortable. We felt safe with the baby gate, monitor and door alarm for the pool. We would most definitely recommend this resort and townhouse to friends and family. We are very happy with our stay here and look forward to the rest of our vacation…a cruise! Beautiful home!! Had a great stay. We will be back! Thank you for providing such an awesome townhouse! This has truly been a home away from home. I especially appreciate the cleanliness of the home in addition to all the little extra touches to ensure our comfort. My daughter LOVED the Disney room and pool! We will certainly be back!